If one man aims to prove, all by himself, that Russia is a country ruled by a handful of cronies of the President, that man is Arkady Rostenberg. Sanctioned by the US on March 20 for being a member of President Vladimir Putin’s “inner circle”, and by the European Union (EU) on July 30, Rotenberg has arranged for a member of the State Duma to compose a bill to allow Rotenberg to receive state budget funding as compensation in the event that the sanctions cut off his cashflow and freeze his assets outside Russia. On June 23, the Russian government refused to approve the draft law, but Rotenberg lobbied the Kremlin to lift the government veto. On September 18 the bill was then pushed through the Duma’s Committee on Constitution and State Affairs. This week it is headed for its first and second-reading votes by the full Duma. On September 25, Sergei Prikhodko, once the President’s assistant for foreign policy and now chief of staff at the prime ministry, issued a full government imprimatur. He declared that the Russian Constitution not only protects the property of Russian citizens in Russia, it also protects their property abroad. “Taking into account the frequent cases of the introduction of certain foreign state restrictions on the citizens and legal entities of the Russian Federation in respect of the rights of the owner of property located outside the Russian Federation and owned by citizens and legal entities of the Russian Federation, the protection of property interests that have arisen as a result of such action deserves attention. These actions will ensure the practical implementation of the provisions of Article 61of the Russian Constitution, which guarantees citizens of the Russian Federation protection and patronage outside the country.” Until Prokhodko issued his declaration, the Duma bill appeared to be worded so as to protect Russians from enforcement in Russia of contested, arbitrary, or improper judgements issued by foreign courts. That was camouflage. Russian reporting of the bill, after the Kremlin revived it, has tagged the legislation the “Rotenberg villas bill”. Acting on the EU’s July 30 directive, the Italian government has issued freeze orders against properties Rotenberg owns in Italy. They include villas at the Sardinian seaside, an apartment in Cagliari (below left), a personal residence in Rome, and a hotel between the Spanish Steps and Via Veneto, called Berg Luxury (right). Rotenberg has not been dispossessed of the assets, currently valued at about €30 million. In practice Rotenberg can continue to tan himself in the Sardinian sun, and drink negroni cocktails on his Roman balcony. The Italian action also does not lock the hotel’s doors. For the time being, though, none of the revenue the hotel’s guests pay for their accommodation -$2,200 for a superior double, $2,800 for a deluxe double – can slip through the hotel’s bank accounts into Rotenberg’s hands. Rotenberg has rubbed more than shoulders with Putin; they used to play games together. In Brussels on July 30, the EU Council made this point as one of the reasons why Rotenberg had been proscribed. “Mr Rotenberg is a long-time acquaintance of President Putin and his former judo sparring partner. He has developed his fortune during President Putin’s tenure. He has been favoured by Russian decision-makers in the award of important contracts by the Russian State or by State-owned enterprises. His companies were notably awarded several highly lucrative contracts for the preparations of the Sochi Olympic Games. He is a major shareholder of Giprotransmost, a company which has received a public procurement contract by a Russian State-owned Company to conduct the feasibility study of the construction of a bridge from Russia to the illegally annexed Autonomous Republic of Crimea, therefore consolidating its integration into the Russian Federation which in turn further undermines the territorial integrity of Ukraine“. The EU’s statement of reasons omitted to mention Rotenberg’s bigger businesses — Mostotrest, a publicly listed bridge builder with a current market capitalization of $675 million; Stroygazmontazh, a gas pipeline builder; North European Pipe Project (SETP is the Russian acronym), a broker for pipes; and two banks, the Northern Sea Route (SMP) Bank of St. Petersburg and InvestCapitalBank. For allegations that SETP was a $4 billion price-fixing racket, read this. For the archive on Arkady, 62, and his younger brother Boris Rotenberg, 57, click. SMP identifies the brothers as controlling 76% of SMP, worth about $300 million of the bank’s reported equity as of December 31, 2013. Moscow. Abyzov, a crony of Prime Minister Dmitry Medvedev’s, has also been exempted from US sanctions against his US assets. For that story, click. On September 23, Baturin claimed Rotenberg kept no money in Italian banks. Last week he and Rotenberg were asked whether, since they publicly contest the Italian action, they have gone to the Italian courts to uphold their property rights. A string of European court decisions, including those of the UK Supreme Court and the European Court of Justice, have rejected the legality of sanctions when they lack reason and proportionality in relation to their purported objective, and when those targeted have been denied their rights, including due process. For the court cases, read here. Rotenberg has not gone into the Italian courts. He and Baturin refuse to say why. The drafting of the bill to compensate Rotenberg out of the state budget began in April – a month after Rotenberg was sanctioned by the US, but three months before the EU acted against him. The draft bill was entitled Federal Law № 607554-6 On Amendments to the Federal Law ‘On compensation for violation of the right to trial within a reasonable time, or the right to enforcement judgment within a reasonable time’. It was dated April 24, and came from the office of deputy Vladimir Ponevezhsky. The preamble of the bill referred to the violation by foreign courts of Russians’ right to trial when a foreign court order or arbitration tribunal judgement was applied inside Russia. In these circumstances, the bill claimed “these court decisions of foreign courts in the Russian Federation are clearly unjust.” For remedy, the bill offered recourse to the Russian arbitrazh courts. According to Article 5.4, a Russian who opposed the enforcement of a foreign court or arbitral tribunal order could apply to the Russian arbitrazh court, not to retry the case nor to nullify the judgement, but to arrange for the state budget to pay the penalty. “The amount of compensation is usually equal to the amount of losses that the applicant has suffered or may suffer as a result of enforcement of a judicial act (the cost of lost property, the amount paid by the sanctions, loss of earnings, other losses). The judgment for compensation shall take effect immediately. Compensation [shall be] awarded by the federal budget.” For the full text of the bill, read here. Ponevezhsky (right), the drafter of the bill, has an unusual background for a politician. Before his election on the United Russia ticket in 2011, he had spent 35 years as a state prosecutor, rising from trainee to a provincial prosecutor, and collecting a law degree by correspondence on the way. When Ponevezhsky tabled the bill late last month at his Duma committee, it was opposed by all three opposition factions — the Communist Party, Fair Russia, and the Liberal Democratic Party. In the debate, they noted the intended beneficiary of the measure was Rotenberg, and that recourse to cash compensation from the budget wasn’t available to all citizens. The Communist deputy, Vadim Soloviev, suggested that a private insurance fund should cover the targets of the bill, not the state budget. In Duma committee Ponevezhsky has claimed his measure would draw twice on budget funds, first to allow Russians hit by sanctions to apply first to the arbitrazh court to award compensation, and then to pay lawyers for the state to go into court abroad to contest the sanctions. The committee chairman, Vladimir Pligin, claimed in committee session that the US and EU sanctions had been promulgated against Russian individuals and companies without their having the opportunity to defend themselves and for reasons “in no way related to their behaviour. Therefore, the [Russian] state is obliged to protect them.” The committee adopted Ponevezhsky’s draft on a majority vote, with the understanding that “improvements”, as Pligin called them, would be made by the second reading vote. orders. Instead, he said, referring explicitly to economic sanctions: “we note that the introduction of restrictions on the property can be carried out not only by the decision of a foreign court, but also to address other competent authorities and officials.” The government, Prikhodko announced, “supports the bill, subject to finalization for the second reading”. 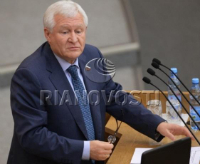 The Minister of Economic Development, Alexei Ulyukaev, then attacked the measure publicly, calling it “a strange bill” in reference to Rotenberg’s lobbying and the Kremlin’s support. “We cannot and should not take such decisions. I am sure that the use of this complex mechanism is unnecessary”. Pligin was asked to explain why he thought Rotenberg and other Russians hit by sanctions should not contest the measures in the European courts before they applied for Russian budget money. He declined to reply, and referred to Ponevezhsky for response instead. Ponevezhsky picked up his telephone, and confirmed his identity. He then asked what the subject of the questions was. When told it was sanctions compensation, he said: “It’s complicated. I am busy, call back later”. Ponevezhsky subsequently refused to respond.